Have you ever wondered how to make the media keys on your keyboard actually work for Winamp? Reader Shawn was asking me this question a while back, but then he figured it out on his own and sent me the instructions. Turns out it’s incredibly simple, and on most installations will be already set by default, but might not be enabled. If yours are not working, then you need to follow these instructions. 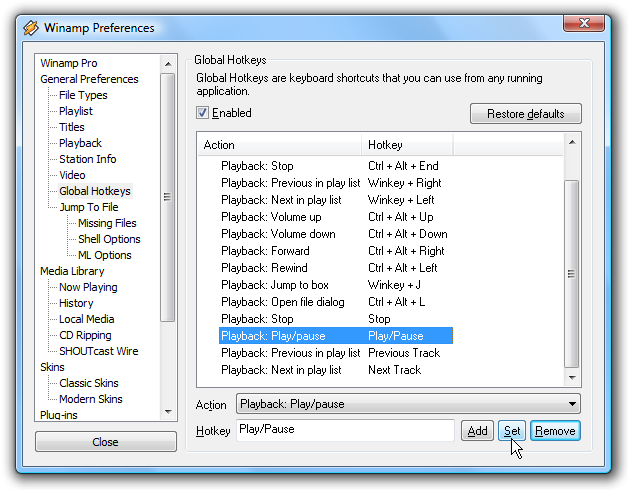 Open up the Winamp Preferences and the browse down to General Preferences \ Global Hotkeys. The first thing you should check is whether the “Enabled” hotkey is checked. If it’s not, then select that and most likely that will fix your issue. If you need to manually change the settings instead, select the Action in the list, and then click inside the Hotkey textbox. Press the media key on your keyboard representing the function you are trying to do. For instance, I selected the Playback: Play/pause action in the list, so I pressed the Play button on my keyboard, which shows up as Play/Pause in the hotkey box. Make sure you click the Set button when you make the change.